The new Berkeley restaurant soars with handmade curry pastes, quality ingredients, and traditionally bold flavors. 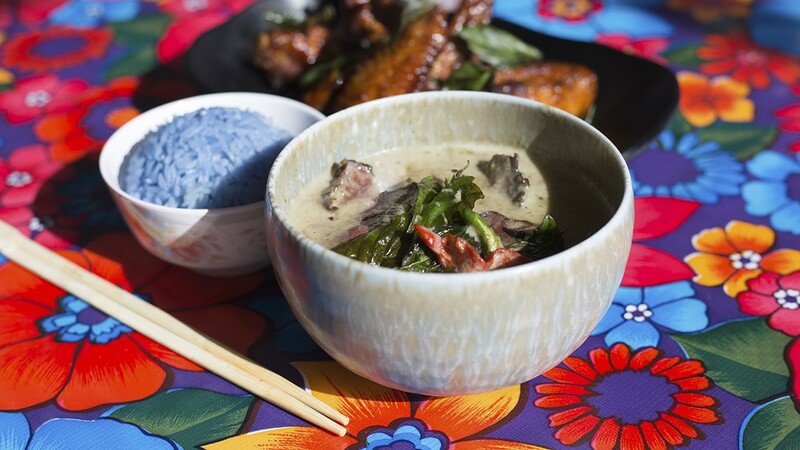 The green curry comes with thick slices of hanger steak grilled rare and rice tinted blue from butterfly pea flowers. There has never been a better time to eat Thai food in the Bay Area. While many of the region's Thai restaurants still serve sweet, watered-down versions of the real stuff back in Thailand, there's an emerging group of restaurants that cater to California's Thai population, which is at an all-time high, as well as those who love bold, spicy flavors. One such restaurant is Funky Elephant, which opened in Berkeley's Gilman district in January. It's a tiny spot with about 20 seats — some of them brightly colored plastic stools, just like you'd see in Thailand — crammed around tables covered in floral print. Owners Nanchaphon Laptanachai and Supasit Puttikaew hail from Bangkok and wanted Funky Elephant to reflect the regional Thai specialties you can find in the metropolitan city. The short menu features salads, noodles, and curries. While there aren't a lot of options, everything on the menu looks good. After three visits, I found that assumption to be true. Chef Puttikaew, who also goes by O, spent more than four years working for chef James Syhabout, most recently as chef de cuisine at Hawker Fare in San Francisco. You can feel that Hawker Fare influence at Funky Elephant, though it's definitely Laptanachai and Puttikaew's own vision. As with the East Bay's best restaurants, Funky Elephant commits to sourcing top-notch ingredients from local purveyors and making just about everything in-house. The prices are higher than your average Thai restaurant — as they should be — but lower than more upscale destinations like Daughter Thai Kitchen. With Funky Elephant, Laptanachai and Puttikaew want to battle preconceived notions that Thai takeout should always be cheap. The curries are a great place to start. Just looking at the green curry, which is actually more beige in color, it's obvious that Puttikaew makes his curry pastes from scratch. He said the green curry paste alone is about 15 ingredients, plus six more to turn it into a velvety sauce. He makes it just like his mom did in Thailand, by hand with a mortar and pestle. It was incredibly complex and delicious, with a spice level that is sure to get your nose running. (Fair warning: Puttikaew said the papaya salad is Funky Elephant's spiciest dish by far.) What really took it to the next level, though, was the beef: thick-sliced hanger steak grilled unapologetically rare. I also loved the kanom jean, a luxurious fish curry soup made with red curry paste and fresh rice noodles on the side. I dunked the pile in all at once following a fresh squeeze of lime as instructed by Laptanachai, who is always running between tables, and slurped deeply. Spice-wise, it was much milder than the green curry but still richly flavored and brimming with perfectly cooked, fleshy chunks of rock cod. To start, do not pass up the Brussels sprouts, which arrived blackened, crispy, and smoky from the wok. Puttikaew tosses them in his own ginger sauce, spiked with red curry paste, oyster sauce, kaffir lime leaves, galangal, and garlic. They were slightly sweet, wholly funky, and all around wonderful. Similarly delicious were the fried chicken wings paired with fried Thai basil. Without any breading, the wings lacked a crunchy crust, but they were juicy and bathed in a funky, spicy, and sweet chili jam that left my hands smelling like fish sauce for hours. Funky Elephant also offers some milder dishes, which are great for those more sensitive to spice. Puttikaew is rightfully proud of his pad Thai, traditionally prepared with fresh tamarind pods. It achieved a lovely, sweet-tart balance with a subtle, slow-burning heat in the background. It comes with creamy cubes of locally made Hodo Soy tofu and two huge, head-on white shrimp. The noodles were sound, but on my visit, the shrimp were slightly overcooked. If you've been searching for your favorite khao mun gai in the East Bay, Funky Elephant's version is worth adding to the list. It reminded me of Hawker Fare's rendition from years ago, when Syhabout still used chicken breasts instead of thighs. At Funky Elephant, the softest of soft, poached breast meat was arranged over garlic- and ginger-infused rice, with a cup of chicken broth and fermented soy bean sauce on the side. The only let-down was the Isaan-style pork sausage, which Puttikaew makes in-house. The texture was impressive, but I was hoping for a more herbaceous punch given its Northern Thai origins. Funky Elephant more than pulls its weight when it comes to fun drink options. The restaurant recently got beer and wine, but its non-alcoholic options are more interesting. In addition to a variety of hot and iced teas, there are cane sugar sodas from all over the world, fresh young coconuts, and fresh-squeezed limeade. The latter is served with a layer of bright purple butterfly pea flower tea on top. Puttikaew also dyes rice with butterfly pea flowers, turning kernels an electric blue. "It's trendy right now, but in Thailand, we've been doing this a long time," he said, explaining his desire to use the flowers, which are believed to have medicinal benefits. Blue-tinted pandan sticky rice added an extra layer of goodness to Funky Elephant's lone dessert offering: soft-serve ice cream made with Strauss organic milk. Puttikaew makes it in-house and changes the flavor each month. I tried mango, which I loved for its densely creamy consistency, untainted mango flavor, and slight sweetness. Even though it's only been in business for three months, the restaurant has already gone through some changes. The biggest is service. Initially, Laptanachai and Puttikaew intended for Funky Elephant to be a fast-casual, counter-service joint with an emphasis on takeout and delivery, given its small size. But Puttikaew didn't anticipate how the lunch crowd would come all at once, and how those folks would expect their food to be ready within minutes. The kitchen got backed up, and since Puttikaew makes everything to order, the desired speed that comes with counter-service just wasn't possible. And since Funky Elephant's menu is a bit unusual, Laptanachai said taking the time to explain dishes to people — at their own tables — just made sense. Nanchaphon Laptanachai and Supasit Puttikaew bring the funk. On a rainy evening, Laptanachai also brought some of the outdoor tables inside to accommodate more guests. Puttikaew said they'll probably move them back out when the weather warms up, but much to his surprise, people seem to like eating in the extra-cramped space. Parties end up sharing tables, as they would at a Thai street stall, to the sounds of pop music blaring. It fits with the vibe and cute touches in the space, such as the neon banana in the bathroom and googly eyes on the paper towel dispenser. Hours: Tue.–Thu., Sun. 11:30 a.m.–9:30 p.m., Fri.–Sat. 11:30 a.m.–10 p.m.